There are two things come to people’s mind when hearing Shibuya: Hachiko statue and Shibuya pedestrian crossing. Nothing represents Shibuya better than these two. I’m sure you know Hachiko well from Richard Gere’s 2009 movie: Hachiko. The movie was based on a true story of unshaken loyalty of an Akita dog, waiting for his master coming back from work at Shibuya station everyday. The master died from cerebral hemorrhage in 1925 and never came to the station. Hachiko continued waiting for the master each day for the next nine years after the master’s death. None ever noticed Hachiko’s presence at the station until a student of University of Tokyo found and developed an interest on Hachiko. He began writing articles on Akita dogs and Hachiko’s loyalty. Hachiko became famous as soon as Tokyo Asahi Shimbun published the article. Hachiko statue was built in 1934 when he was still alive, in fact he was standing next to the statue at the opening ceremony. Hachiko died on the street of Shibuya in 1935. Initially Hachiko story was only famous in Japan before the movie. 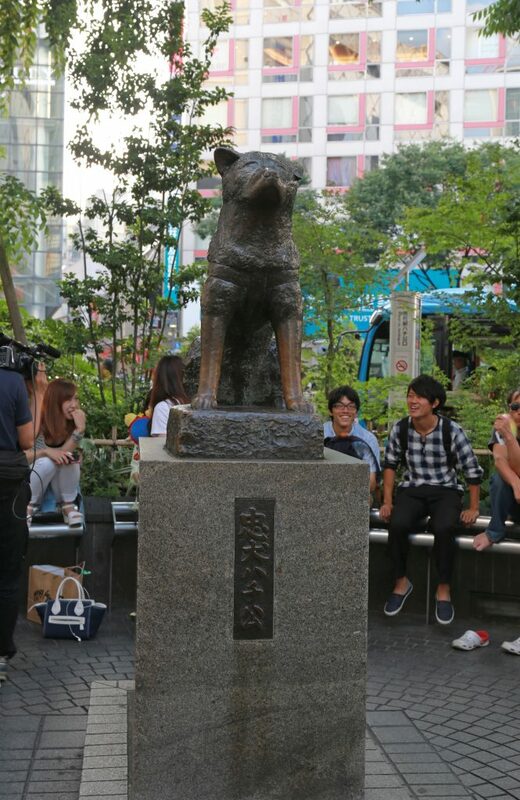 Now the world knows the story behind the Hachiko statue. Whenever in Tokyo, visiting the legendary Hachiko statue is in everyone’s list, well at least for a first time visitor of Tokyo. 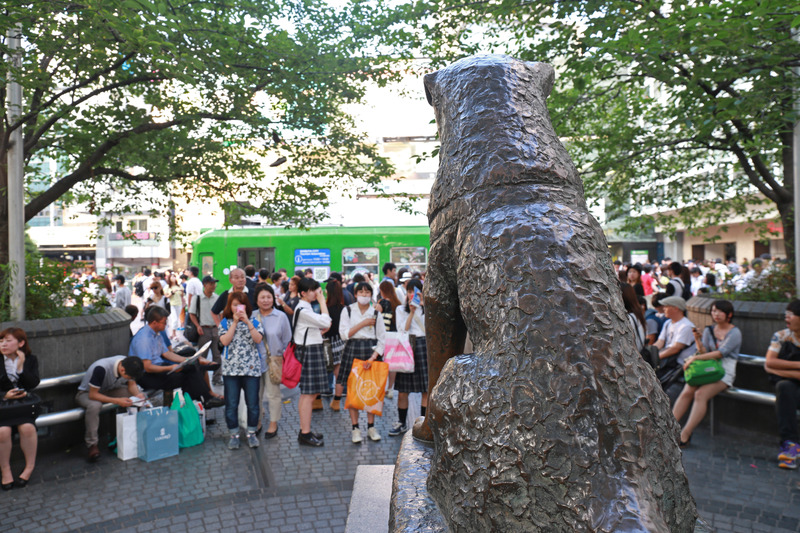 For many years Hachiko statue is used as a meeting point and for tourists, Hachiko statue is a famous photography spot of Shibuya. I have been to Shibuya many times but never took time to seriously take pictures of Hachiko and Shibuya crossing. So I spent few hours to go around just to take pictures of the busiest part of Shibuya. Taking pictures of Hachiko statue requires a lot of patience especially in busy hour of 5pm. There is never a queue but people look at each other as a way of saying “let me go first”. Hachiko statue is built facing the station, symbolises Hachiko’s waiting for the master to come. 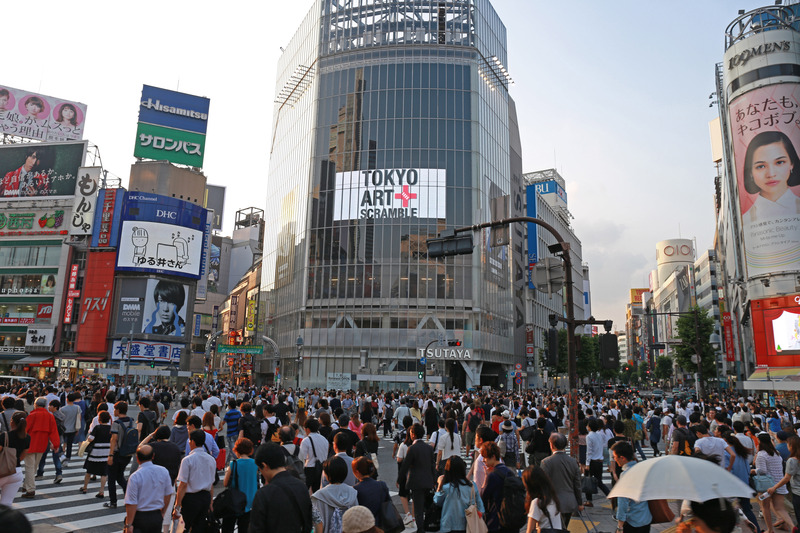 Shibuya crossing is only few steps away from Hachiko statue. 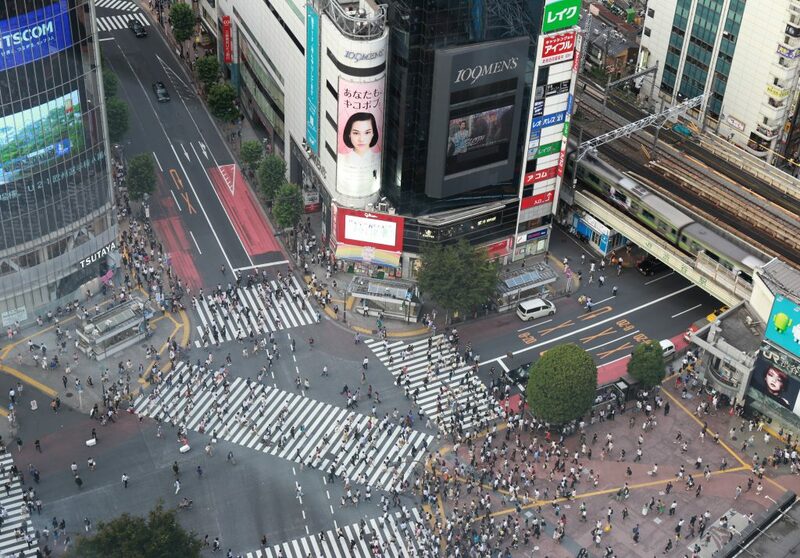 This Shibuya crossing is world’s busiest and most famous pedestrian crossing. People never stop coming from all directions then scramble to cross the street as soon as the traffic light turns to green. 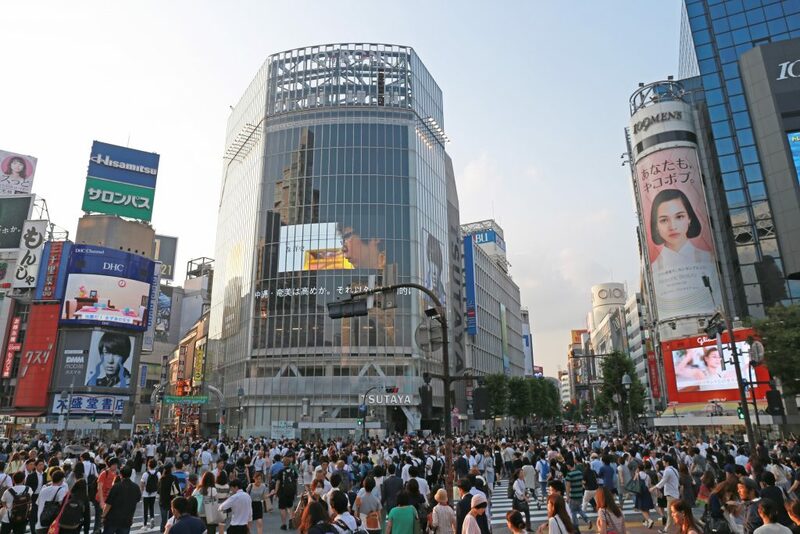 The famous spot to take picture of Shibuya crossing is from the outside of Hachiko statue area facing Tsutaya bookstore and a giant screen. Advertisements continuously played on the giant screen. I waited for the best advertisement on the screen “Tokyo Art Scramble”. That said a lot of volume of Shibuya crossing. Second photography spot of Shibuya crossing is (or was) from Starbucks Tsutaya 2nd floor which offers direct view to the crossing. Sadly, the glass window was blocked with white sticker when I was there. I found it a little bit difficult to shoot from that point. Which made me went straight to the 3rd photography spot: framing Shibuya crossing from the height through a thick glass window. It took me 15 minutes to reach to this point, the crossing was still busy as ever. 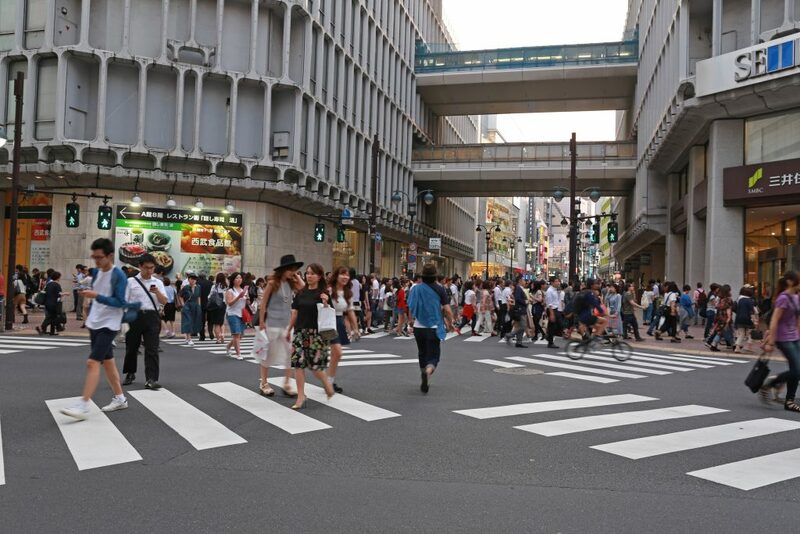 It is said Shibuya houses Tokyo busiest pedestrian crossing even its less famous corner is a sea of people. When the sun faded away, more people inundated small alleys of Shibuya. 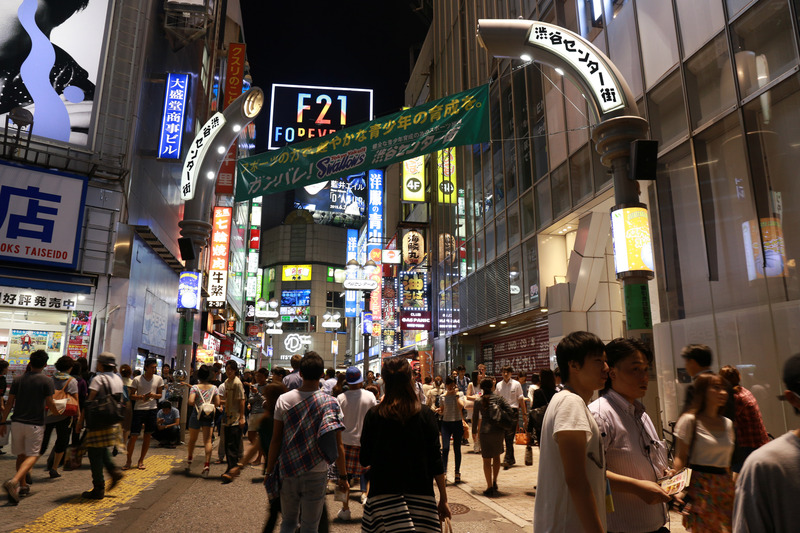 Sentagai or Central Avenue is a famous alley of Shibuya where the young hangs out. For the first time in Tokyo I felt a little bit unsafe. People talked so loud and some seemed drunk too early. I tried hard not to pay attention, focused only on taking pictures. Suddenly someone next to me screamed so loud nearly hurt my ears, I felt something wrong with the ground. I nearly fell out of balance. It turned out the uneven ground I stepped on was his feet. He looked at me furiously as I ran away after a quick apologize. I felt sorry for his toes. My platform shoes must have hurt him badly. A lesson learnt: never ever step on someone’s toes. I moved quickly to different alley. There were queue at almost every restaurant in the alley. The bright neon sign boards made people failed to notice the time. It felt like the sun just set. It was already over 9pm. I got carried away by Shibuya like many others. I rushed to the station only to find a long queue for Ginza line. Lucky that Shibuya is the last stop of Ginza line I could still get a seat on my way home. What do you like the most from Shibuya? 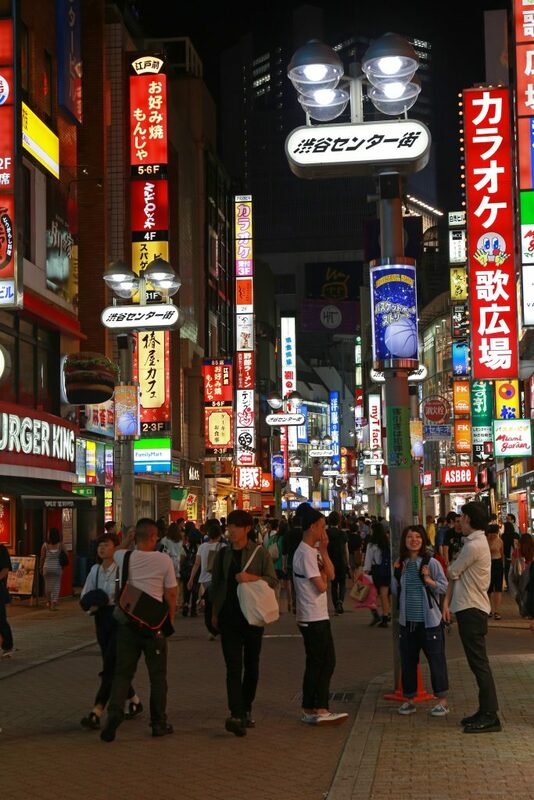 Have you ever stepped on someone’s toes in Shibuya? Beautiful photos, dying to visit here someday — looks amazing! Thanks Eden. It is a nice place. Hope you have a chance to go around Japan one day. It worth every penny. It’s always great to see a travel blogger based in Japan! Are you an expat or a Japanese? HEHE Just curious. My husband and I are currently based here and this is our last year in Japan 🙁 Hopefully he’ll extend. Hope to see you around Mima! I’m an expat living in Tokyo. Glad you found TiptoeingWorld in blog forest. I hope your husband can extend the stay in Japan. It’s a beautiful country to explore. Are you in Tokyo? Hey Mima! I have a great news! We’re extended for another 4 years!! WHOHOOO!! 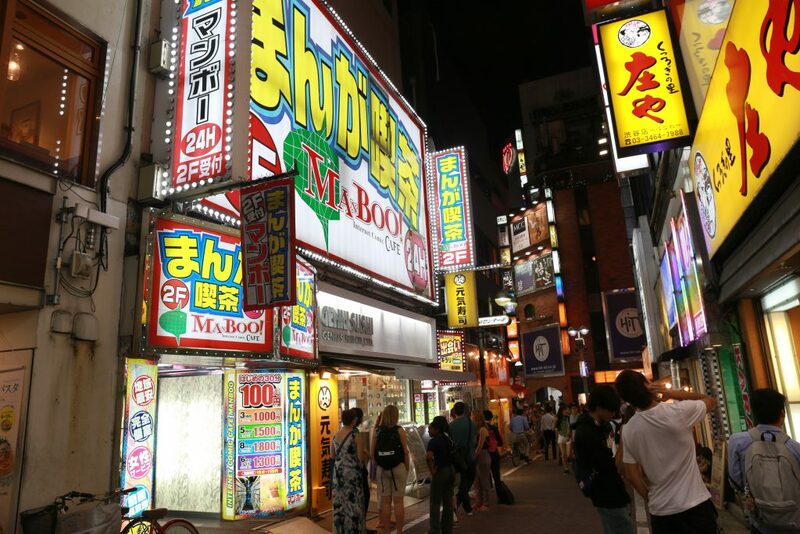 Shibuya was one of my favourite places! From Shibuya Excel Hotel Tokyu at Shibuya Mark City. It’s easy to shoot from that hotel especially from its restaurant. I see, have been checking it out. Thanks Mima!